Hmm, an apple that won’t turn brown if you bite it, cut it, or bruise it. When I first learned of this engineered, non-browning apple, I was a staunch supporter of the anti-GMO movement. Surprisingly though, even then I didn’t find anything scary or weird about this product in terms of it being dangerous to eat. I just thought, who cares about browning? Is our society so whitewashed that it can’t even tolerate a brown apple? I actually posted my opinion to this effect back on 4/10. Since that post, two things have happened. First, as most of my readers have probably noticed, I have greatly moderated my views about GMOs and am doing everything I can to balance out the half-truths, falsehoods and propaganda I once posted with posts backed up by real evidence that is known and respected in the science and agricultural communities. With solid reasoning under my feet, I now break into a trot on this altered GMO course. Still learning. Still growing. Still open-minded. Still pretty clueless about science, but I’m getting better. Second, I heard from the company that wants to put this non-browning apple on the market. Joel Brooks from Okanagan Specialty Fruits, (OSF) headquartered in Summerland, British Columbia, explained to me why an apple that doesn’t brown when eaten, sliced or bruised is, indeed, such a big deal. Apples and other produce (e.g., pears, bananas, peaches, potatoes) contain an enzyme (called polyphenol oxidase, PPO, or tyrosinase) that reacts with oxygen and iron-containing phenols that are also found in the apple. The oxidation reaction basically forms a sort of rust on the surface of the fruit. You see the browning when the fruit is cut or bruised because these actions damage the cells in the fruit, allowing oxygen in the air to react with the enzyme and other chemicals. Turns out, folks are pretty darned turned off by browned apples. Enzymatic browning, the kind described above and the kind the Arctic Apple is engineered not to do, affects the entire apple supply chain from farmers and packers, to suppliers and grocers and finally consumers. At any point in this chain, the bruised ones get thrown out. I had to ask myself, when was the last time I chose a shiny, bruised apple from a produce market? Easy answer. I never have. And kids? Well of course, they’re even pickier. So, when Joel from OSF commented on my 4/10 post, I became intrigued because he made three really good points about this browning effect. 1. Nearly half of all apples that are grown never make it all the way to consumers’ bellies. This is largely due to superficial blemishes/browning which means countless perfectly-good apples are thrown away for purely cosmetic reasons – we hope to help address this needless food waste! 2. The obesity crisis continues to be a major issue for North Americans, and this is in part due to 25% of consumers’ daily calories coming from snack foods. Many consumer surveys identify foods like chips, chocolate and soda as the most popular snacking options and we think fresh cut fruit can help replace these unhealthy options. Studies show that pre-sliced apples significantly boost consumption, especially for kids, and Arctic apples are ideally suited for this market. 3. 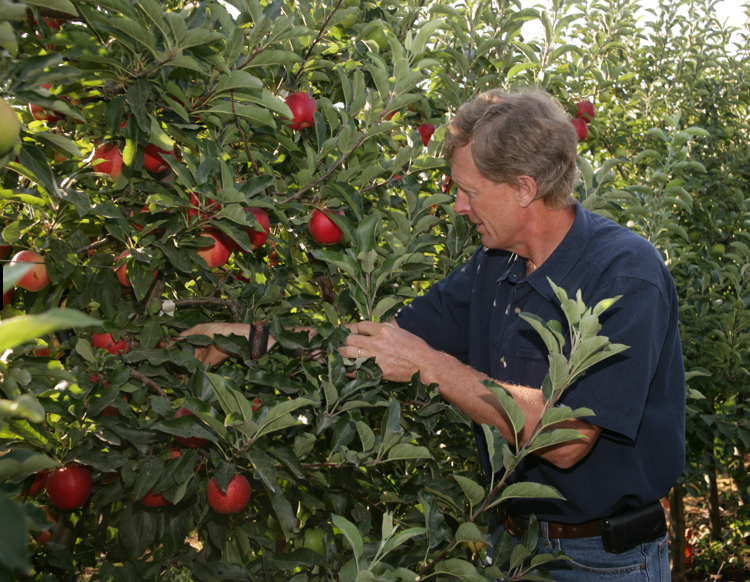 While freshcut apples are available now, the anti-browning treatments are costly for producers and require additional labor time too (costs which are passed, in part, to consumers). Not only do non-browning apples help address these costs, they do so while avoiding treatments which can sometimes give an “off-taste” and create potential allergy concerns (such as sulfite allergies). Joel went on to say: These are just a few reasons we think Arctic apples can make a difference in reducing food waste and helping consumers eat healthier by boosting apple consumption. We are a small, grower-led company committed to education, open communication and transparency. I was impressed by how Joel reached out – wanting to further educate me and doing so in a friendly way. When I decided to run a benevolent GMO series, I knew this apple belonged in the mix. As I’ve learned more about OSF the company, I knew it too belonged in the mix, as it is as well-meaning a company as any organic one out there. So, what is the science? How do they do it? Is it safe? Company CEO and founder Neal Carter explained it to me this way: To make an apple non-browning we reduce its production of PPO by “silencing” the genes that produce PPO. This way, when an apple is cut or bruised, there isn’t enough PPO to begin the chemical reaction that results in the unappealing taste, texture or brown appearance. 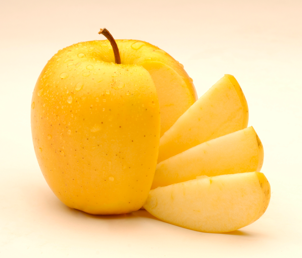 Yes and no… There are two distinct types of browning in apples: enzymatic browning and secondary browning. Enzymatic browning results when apples are bruised. And, when an apple is bruised, rot can set into the bruise causing secondary browning. Enzymatic browning (a.k.a. primary browning) occurs when an apple’s cells are damaged, such as through cutting, bruising or biting the fruit. For example, if someone were to drop an apple, there may be no signs of harm at first, but the slightly damaged cells on the apple’s surface will brown (bruise) due to the enzymatic reaction. Secondary browning, on the other hand, most often refers to the discoloration that comes from rotting, such as when an apple is broken down by fungi and bacteria. In Arctic apples, the gene sequence that enables enzymatic browning has been “silenced” but these apples will still undergo secondary browning just as conventional apples do. So, this also means Arctic apples make it easier to identify the true quality of the fruit! Sounds great so far, right? Well, there are folks out there who are scared of and feel threatened by this apple. 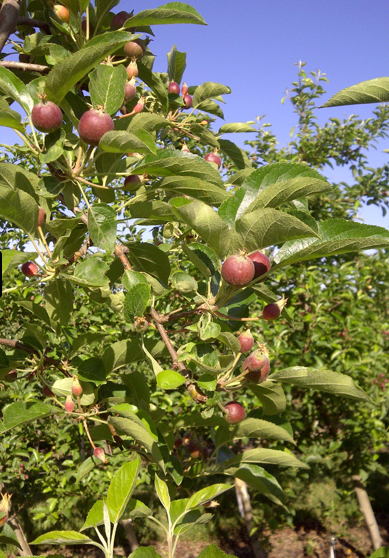 In just a few clicks I found several locations on the web where information about the apples is being batted about and none of it resembles anything like what is posted above, information from the actual grower. The Organic Consumers Association, an anti-GMO activist group, posted this article. In keeping with the coined terms “frankenfood” and “frankenfish”, we now see “frankenapple”. 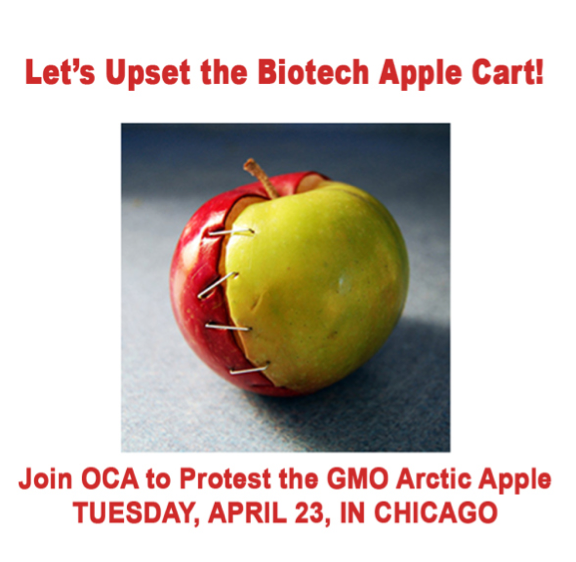 Organic Consumers Association calls the Arctic Apple a “Frankenapple”. I asked Joel if the Arctic Apple got its real name because it stays white all the time and he answered that I was essentially right, but passed on this official quote which explains the name perfectly. Are these apples in stores now? No, the regulatory process is still going on and will be going on for awhile yet but according to their website, they hope to be on store shelves in 2014/2015 in the US. Canada will take longer. I, for one, look forward to slicing one and taking it to work, only to find several hours later that it still looks great! I am also including a Tedx Penticton video featuring Neal Carter. He talks about biotech in general and tries to dispel some of the myths. I am struck by his kind demeanor. He comes across as someone deeply concerned about people and sees biotech as a powerful tool to offer real benefit to populations worldwide. J. Fourat’s blog Random Rationality and his Q & A with a Biotech firm which is part of his Lowdown on GMOs series. He speaks to Carter in great detail about the apple, other pertinent issues and biotech in general. A great read! The Arctic Apple homepage is the best jump-off point for information but I posted a few specific links I thought were most relevant to this post. PSU’s Plant Science Consortium presents Dr. Steven H. Strauss of Oregon State University to give an evening lecture on genetically modified crop plants followed by a brief discussion. Where: PSU – Cramer Hall, Room 53. Light refreshments will be served. The lecture is free and open to the public. Please see the attached flyer and description below. Lecture Description–Although many forms of genetic modification are common and widely accepted in agriculture, direct DNA modification has been extraordinarily controversial. I will discuss what direct DNA modification is, its presence in our current food supply, and the roots of the ethical divide. I will conclude by considering the damage done by distraction from the core issues of sustainability, economic value, and humanitarian progress, and provide a vision for resolution. Bio–Dr. Steven H. Strauss is a Distinguished Professor of Forest Biotechnology in the Department of Forest Science at Oregon State University, and has a joint appointment in the Molecular and Cellular Biology Program. His current research focuses on genetic engineering of flowering for genetic containment in poplar and eucalypt trees. He directs the OSU Program for Outreach in Resource Biotechnology that is aimed at promoting public understanding, and facilitating science-based public debate, about food and natural resources biotechnology. Thanks Katie for the info! I will try to make it. PSU is one of my alma maters. Go Vikings! Thanks so much for this article, and your entire site. I had no idea these incredible apples existed! I am currently obtaining a Master’s in Health Communication, and one of my lifelong aspirations is to help improve scientific literacy among Americans so that the fear-mongering tactics of the anti-GM, anti-vax, and other pseudoscientific groups hold less sway on the public’s emotions and opinions (no small feat, as you can imagine). It really helps to read your articles and get into the mindset of an autodidact of biology and genetics, and to see what helps you make sense of biotechnology as an everyday person, especially as a previous anti-GMer! You are so rad for diving head-first into exploring your own shift in worldview, and then communicating these facts to a wider audience. Thanks Madelin! It is a unique position from which to blog. Sometimes I feel way under-dressed at the science party but I also know it is imperative that I help communicate sense in a world of nonsense – to the best of my ability. I have certainly learned a lot and have much to learn. BTW: had to look up “autodidact” – love it and yes, I am one.